Stand on a beach and you have the sand under your feet. If you look out over the horizon you can see the ocean. Is that water like the water coming out of your tap at home? No. Is that like the water in a lake? No. Is that water similar to the water in an estuary connected to the ocean? No. You are looking at a solution of water and millions of compounds. Lakes are usually fresh water. They have a very low concentration of ions and chemical compounds. An estuary is a place where seawater and freshwater mix. Your tap water is treated water from which organisms and excess ions have been removed. Most of the chemical compounds you find in the sea are dissolved solids. The oceans are just big solutions. It's amazing that the oceans have basically the same mixture everywhere in the world. There are still local differences, but overall oceans are the same. They are similar because the oceans are constantly circulating and mixing the compounds in solution. Oceans probably started out as fresh water. As the Earth developed, there were huge amounts of rain. That rain-washed all sorts of particles and chemicals into the ocean. 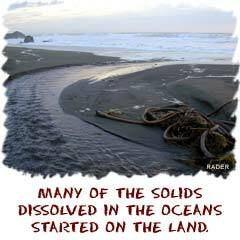 After a few million years, it evened out and the amount of things coming into the ocean equaled the amount leaving. It's a term called equilibrium. There's always some chemistry going on in the world. In these huge oceans are a few basic elements/ions. They are chlorine (Cl-), sodium (Na+), magnesium (Mg++), sulfates (-SO4--), calcium (Ca++), potassium (K+), and bromine (Br-). Seawater is often called salt water. That name is used because chemists consider those ions to be the salts in the sea (sodium and chlorine are the elements in table salt). Oceans also contain dissolved gases from the atmosphere. As the ocean circulates, the waves and the pressure from the atmosphere push gases into the solution. The gases include carbon dioxide (CO2), nitrogen (N2), and oxygen (O2). Of course, there are many particles and organic matter (plants and dead animals) but not much compared to everything else. Those particles are not dissolved in the salt water. They just float around. There are also factors that change the ocean's chemistry. Sometimes more minerals enter the big solution. When it rains, more sediment can run off into the oceans. Sometimes (on a local level) the number of organisms increases. One example of those organisms is called a red tide. A red tide happens when a bunch of algae comes into bloom at one time. On a large scale, the circulation of the water changes the chemistry of the oceans. Local areas of high concentration are diluted when new water moves in. 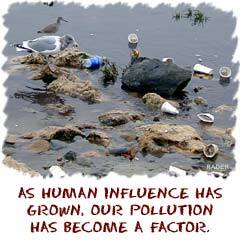 The last factor is the atmosphere. It covers the whole world and can change the ocean. The winds can cause the water to circulate faster and waves to get bigger. All of these ingredients move the ocean and change the amount of dissolved molecules trapped in solution.